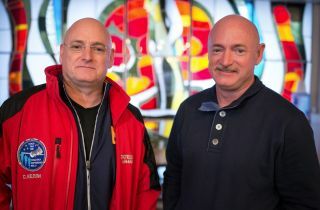 Scott Kelly (left) and his identical twin brother Mark at the Cosmonaut Hotel in Baikonur, Kazakhstan on March 26, 2015, shortly before Scott launched on a one-year mission to the International Space Station. Former NASA astronauts Mark and Scott Kelly will be honored by their hometown of West Orange, New Jersey, today (May 19). You can watch a livestream of the dedication ceremony on the West Orange Public Schools' Facebook page. The Kelly brothers — the only set of twins ever to fly in space — will receive "Mayoral Medals," and the elementary school they attended (currently called Pleasantdale Elementary) will be renamed after them during a ceremony in West Orange. Scott Kelly recently returned to Earth in March, ending a nearly yearlong mission to the International Space Station. Mark, who retired from NASA in 2011 (Scott retired last month), helped scientists on Earth during the mission by participating in NASA's Twins Study, an unprecedented project that meticulously monitored the identical twins to see exactly how the human body changes during ultralong space missions. Here's a brief rundown of the identical twins' spaceflight history, along with a biographical tidbit or two. Total spaceships flown: 4. Space shuttle Discovery (Mark 2 times and Scott 1 time); space shuttle Endeavour (Mark 2 times and Scott 1 time); Russian Soyuz spacecraft (Scott 2 times); International Space Station (Scott 2 times). Total spaceflights: 8. Mark: STS-108 (2001), STS-121 (2006), STS-124 (2008), STS-134 (2011). Scott: STS-103 (1999), STS-118 (2007), International Space Station (ISS) Expedition 25/26 (2010-11), ISS Expeditions 43-46 (2015-16). Missions commanded: 5. Mark: STS-124, STS-134. Scott: ISS Expedition 26, ISS Expedition 45, ISS Expedition 46.